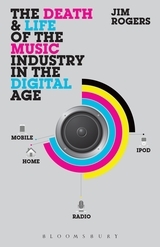 Jim Rogers’ PhD-thesis at Dublin City University was recently published under the title “The Death & Life of the Music Industry in the Digital Age” at Bloomsbury/London. He interviewed 30 music business professionals in the UK and Ireland from 2007 to 2010 to answer the main research question if the Internet caused a crisis in the music industry that is signalling its final collapse or if it, in contrast, resulted in an intensive restructuring and reordering within the industry. He concludes that the music industry has not undergone a fundamental structural upheaval but was reshaped by an evolutionary change. Rogers observes more continuities than discontinuities in the music industry and states that most of the music industry actors do more or less the same things but in a different way. In the following I highlight how the author comes to such a conclusion. The question if streaming is the next big thing for the music industry will be eventually answered by the music consumers. Several studies were conducted in past few years – most of them commissioned by music industry bodies – to assess the future potential of music streaming. It is essential for music streaming services and the copyright holders (labels and music publishers) if consumers are aware of streaming services, if they are using them frequently and if they are prepared to convert from Freemium to subscription models. Therefore the results of the studies are important indicators for the future development of the music industry. Although they provide different and even contradictory results – due to a different methodology – they help us nevertheless to understand music consumption behaviour in the digital age. In the following I would like to review some of the studies published in the past three years.